Larsen Thompson – a name heard ’round the world and one known for being an immensely talented dancing and modeling sensation. The remarkable Larsen Thompson is, without a doubt, taking the entertainment world by storm. Each and every day holds a new success for the brilliant Larsen Thompson. We’ve seen Larsen Thompson’s extraordinary and breathtaking beauty (both inside and out) in many exceptional projects – from music videos, commercials, and beyond. In fact, Larsen Thompson was the lovely leading lady in BORNS’ “American Money” music video and she also starred in Deorro’s music video. Larsen Thompson’s gorgeous face is a familiar one in many campaigns for renowned brands including being seen on billboards around the world for Juicy Couture, modeling for Brandy Melville, and she started off 2017 in an exciting way with a Gap Fit campaign where she can be seen in Gap commercials and Gap stores all over. In addition to her incredibly successful modeling career, Larsen Thompson is also known for being one magnificent dancer. She combines her mesmerizing dancing talent with her modeling career as seen in many of her projects and she truly stands out in the entertainment world as one multi-talented and stupendous, young lady. We’re not the only ones who adore Larsen Thompson oh, so much, the sensational Betsey Johnson loves her just as much as we do and has even worked with Larsen for her Capezio campaign and in the “Trolls” commercial. Larsen Thompson is an icon in the fashion world and she always looks so effortlessly chic and stunning. Despite all of her massive success, Larsen remains to be one of the sweetest and most down-to-earth individuals on this planet and she always radiates her positivity and exuberant persona to everyone around her. Larsen Thompson is one marvelous role model to all of her fans and she truly deserves all of her successes as she is one hard-working and genuine, young lady. 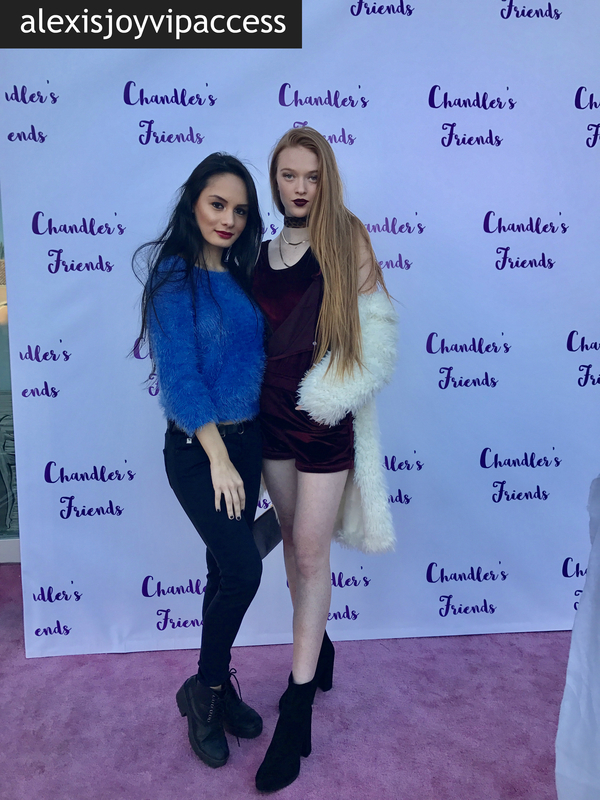 I, Alexisjoyvipaccess had a fantastic time at Chandler Kinney’s gift-wrapping event and had a great time catching up with and interviewing the wonderful Larsen Thompson again at the event. Larsen Thompson dished exclusively to Alexisjoyvipaccess all about what it was like working on set of BORNS’ “American Money” music video, what is something she has learned from Betsey Johnson that she continues to hold on to, what it was like working on set of the “Trolls” commercial, and so much more only in our VIPAccessEXCLUSIVE updated interview. Larsen even took on a fun speed round and spilled on what her go-to dance move is, what her favorite song is at the moment and more – hear what she had to say in our VIPAccessEXCLUSIVE updated interview below. Thanks for another fun interview, Larsen – always a blast chatting with you! Check out my VIPAccessEXCLUSIVE updated interview with the ravishing Larsen Thompson at Chandler Kinney’s gift-wrapping event below! Previous VIPAccessEXCLUSIVE: The Wonderful Paris Smith Interview With Alexisjoyvipaccess At Chandler Kinney’s Gift-wrapping Event! Next VIPAccessEXCLUSIVE: The Incredible George Caceres Interview With Alexisjoyvipaccess At The Celebrity Experience!